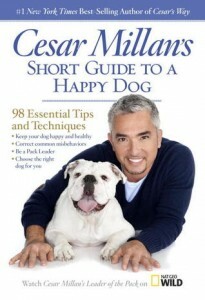 While still technically research, I'm going to file Cesar Millan's Short Guide to a Happy Dog: 98 Essential Tips and Techniques as my 'book about an immigrant or refugee in the US' selection for my 2016 (Blended) Reading Challenge, since it seems to be pretty heavy on the memoir side. I, apparently like many others, expected a short read of an 'essentials' list, which isn't exactly what this is. Still, I enjoyed it and found it to be an interesting read. There's a lot more personal history and anecdotes than I expected, but I enjoyed learning more about Cesar's life. I'll admit that I've only seen the first season of his Dog Whisperer show, so I'm not really all that familiar with him. I've seen and appreciate his way with dogs, although I did have some hesitation about his supposed “dominance theory”, which has soundly been debunked. HOWEVER, I don't think Cesar actually espouses the 'dominance theory' as it's usually understood. Perhaps he did in the past – and I do recall seeing some pretty questionable 'alpha roll'-type behavior in his show – but I think he has listened to his critics. He opens with a 'how to read this book' section that addresses some of those concerns and clarifies what he actually means when he's saying dominance and control. I'll say that I quite agree with him about those words generally having an unnecessarily negative connotation in English, and I personally have and understand positive definitions of the words, so I have no personal issues there. I do disagree with the actual dominance theory as per the really old, not-so-stellar wolf study which was debunked, but I think that what Cesar Millan discusses (at least in this book) is more of an 'energy theory' than anything. And one which I think make sense and will be helpful for my family. This book shares some tips from choosing the right type of dog to training problem issues to helping your dog through major upheavals. It stresses the responsibilities expected of pet owners as well as giving tips & insight into dog psychology. He shares case studies and personal stories to illustrate each point, and I appreciate that he focuses on 'training' the humans possibly even more than the dogs. Despite not being quite what I expected, I did very much enjoy the book and will use many of the tips I gathered.